To save the following files on your computer, right click on the link and click "save as" or "save target as." Clicking on the links individually may or may not lead to the file streaming across the internet. It depends on the file type and the server hosting it. Please help conserve server bandwidth. Please download each file from a seperate server. 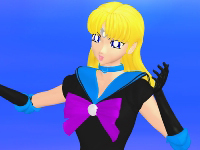 A wonderful little 3D animation of Silver Arrow Strike done in Poser by Tuxedo Mask (Caio Amaro)...the voice is provided by the same girl who is also voicing Tien-Lei in the upcoming SMZ radio play. :) Another fantastic 3D animation by Tuxedo Mask (Caio Amaro). This time of Rain Flood. It has cute watery sound effects too--thanks to Jenny/KakyuuHime for providing Sailoraquarius' voice. Thanks to Saine for providing space. 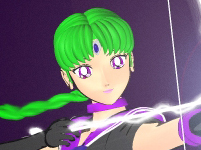 She's a doll and does a lot of great fanart for myself and others in the SMMT community, so visit her site! :) If you'd like to host files, please contact me.